Off the floor and onto the table, I’ve got wood! Medium density fibreboad wood that is. This is the story of how my first purpose built Infinity board came to be. As a longtime 40k player I have for many years been responsible for holding on to everyone’s terrain. Me and my brother did the lion’s share of painting and basing but we did get a lot of really cool pieces from the people around us, so mad props to them. 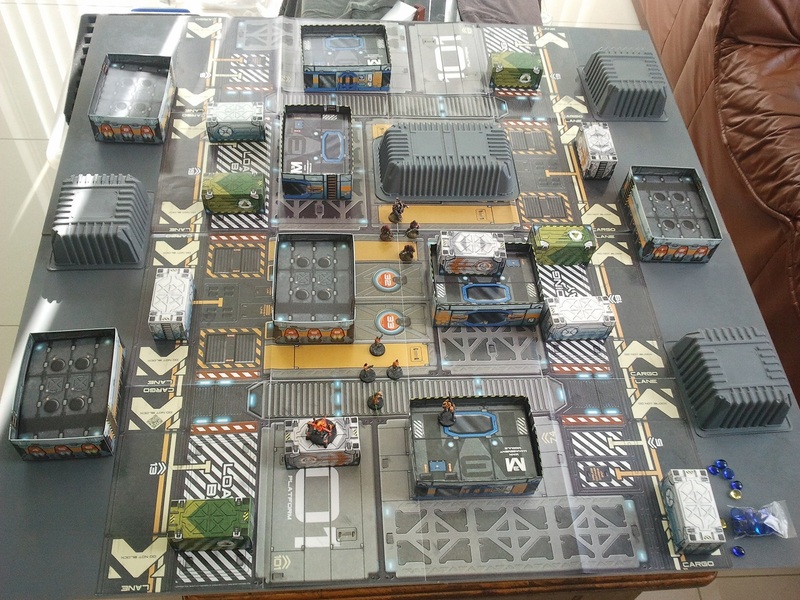 Our first serious board, my brothers brainchild, was a now discontinued static grass mat from Games Workshop pasted to a 6×4 foot MDF board that was then cut into 6 24×24 inch tiles. A selection of the 40k terrain on one of these tiles is shown below. Rampaging space clowns assault a position held by mutant cultists and genetically modified super soldiers who are also evil. Just another day in 40k. That must’ve been something like 10 years ago. 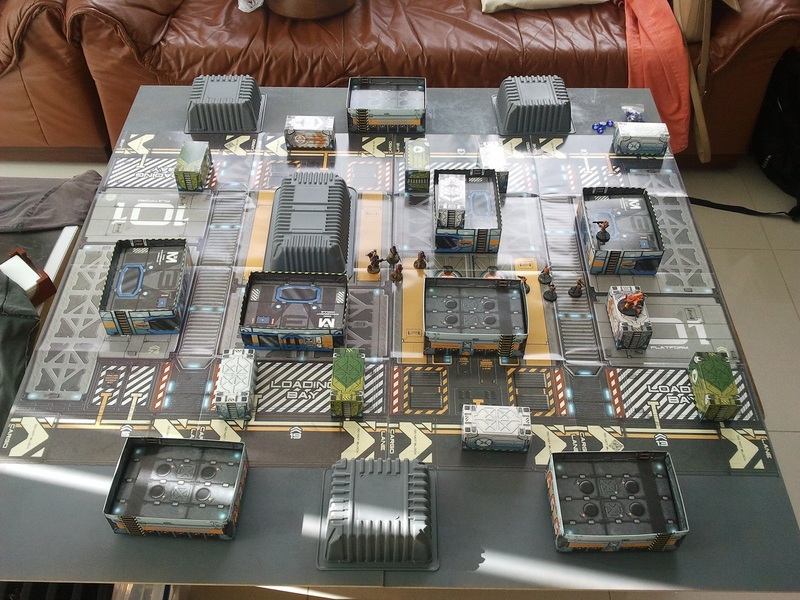 We later bought a Citadel battlemat for days where the game would not be coming to us and our friends had a big enough table. Pretty sure GW has retired the battlemat in favour of the Realm of Battle. 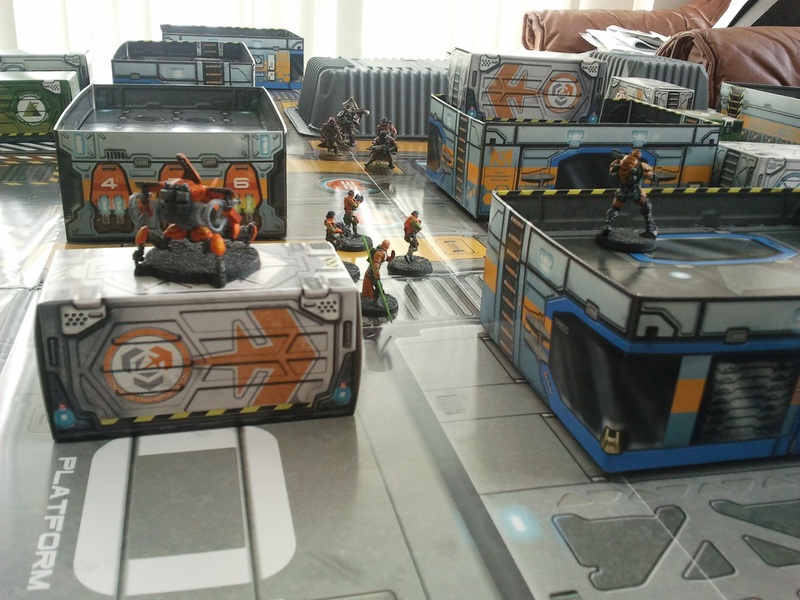 Persistent urban legend in Infinity is that American players across the country first tried out the game on their existing 40k tables. Upon activating their first troops and being gunned down by snipers in ARO, they vowed “never again” and set about creating the most complex, tortuous, convoluted and multi-layered terrain set ups imaginable. Needless to say I needed something more suitable for Infinity. 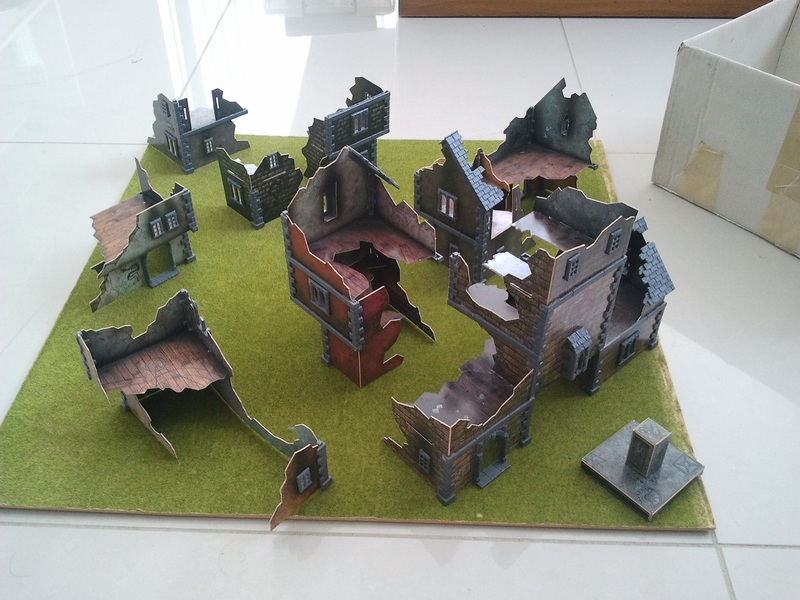 On discovering that I had taken up Infinity, a friend of mine through my older brother, and long time wargamer thanks to his own older brother handed me over his Mordheim terrain. His own hobby interests had taken a backseat on account of having a life and had been carrying around an absolute trove of classic wargaming material in the boot of his car. 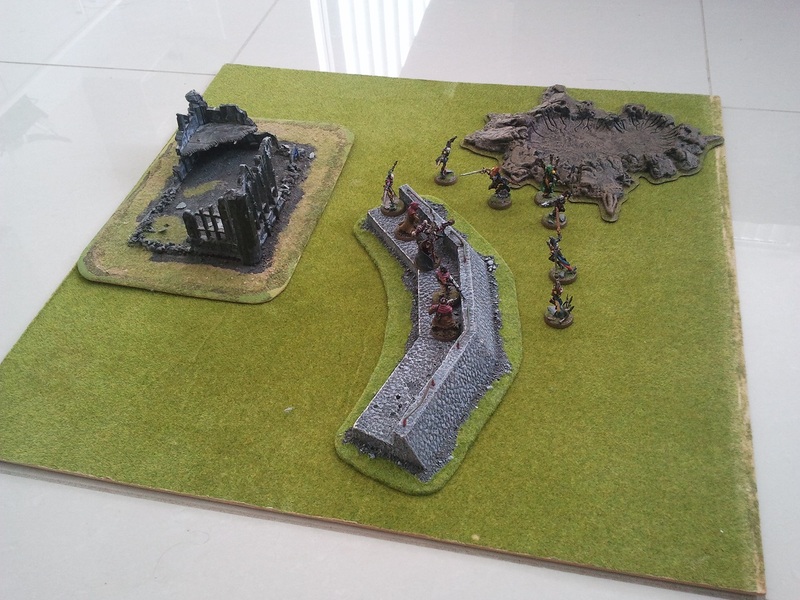 A sample of the Mordheim setup is shown below. No cover sniper paradise. 0/10 Would not play. I did my first demo games to learn how it all works with this terrain. As cool and suitable as it is, it doesn’t really reflect the Sci-Fi setting so much. You could pass it off as a Highlander settlement on Dawn, but that will have to take a back seat till I meet someone who plays Ariadna. Another problem was I moved to a smaller apartment, with only a coffee table to play on. The 2×2 feet boards when arranged in a square had way too much overhang, it was not safe to play on. So I went back to the drawing board. I needed a board that could be stored when not in use, but would not fall off the coffee table. I resolve to build it out of 2 rectangular sheets of MDF that would lie perpendicular to the rectangular coffee table. Luckily Bunnings has standard pannels of MDF in 1200mm x 600mm x 6mm sheets. I weant with 6mm high because 3mm MDF sags too much. I grabbed a pair of the boards and some cheap grey spray paint. Ice storm came around and with it the Moto-Tronica scenery pack, I grabbed a pair of those scenery packs to populate the board. These alone can not really fill out a 4 x 4 foot table, so I needed something extra. Due to amazing foresight, I had held on to the plastic inserts that come with Kejia brand frozen Jiaozi, and a plastic tray that comes with 1 kg of minced beef at Woolworths, because they looked like they might be able to become terrain some day (Sadly the cubic metres of packing styrofoam from washing machines and fridges I’ve accrued over the years remains waiting for the day it becomes the terrain it sorta kinda looks like). These plastic pieces got hit with the same grey spray paint and presto, I had my first purpose build Infinity table, infinitely configurable and easy to store, created in one hour after all the materials were acquired and at a very low cost.